Okay, at first I was thinking that this pre-season NHL in Europe thing was a good idea. But now I've changed my mind and want to register a complaint. It shouldn't be done ever again. Unless - unless - there's much better coverage involved online. The NHL barely acknowledges that these pre-season games against European teams are going on, and there's no official statistics or scoring available. Do you know how frustrating it is to know that you could be watching a hockey game online, but you can't because you're at work? It drove me completely crazy. I hate an unsatisfied curiousity! Grrr...!!! Yeah, great, scores are wonderful. Whatever. Wins and losses matter most at the end of the season when trying to get into playoffs. Individual player statistics matter most during the pre-season, and none of that is getting out of Europe. At least none of that is getting out of Europe for Tampa Bay. When the Lightning played in Berlin, the most helpful site was Eisbären Berlin's website. Sure, it was still in German, but at least you had an idea of what was going on on an individual basis. HC Slovan Bratislava's website isn't so helpful in that way. However, if you're able to, you can watch the game streamed live over the internet. Wasn't that kind of someone? Especially for a 1 o'clock in the afternoon start during the work week on the East Coast of North America? It probably would've been in Slovak, anyways, but at least you could see what was going on. Seriously, if the NHL wants to promote the idea of going to Europe, it should not just do that in Europe. It should also do that at home in North America. Let the North American fans experience the European games as well, pre-season and all. Most sports fans have heard about the crazy football (soccer) fans over there, and some of us might like to see that. We'll be more forgiving of you when the players start getting injured later on in the season. Because, you know, people will be saying, "if they hadn't gone to Europe, then so-and-so wouldn't be injured now." I'm not saying it's right, I'm just saying that it's going to happen. Everyone can totally understand the Olympics. Who wouldn't want to participate for their team and their country? But just to go hop the pond for a couple of games? What do the North American fans get out of that except tired and rundown teams? Again, I'm not saying it's right, but that's what people are going to start thinking if key players go down later on this season. Okay, I'll get off of my soap box now. By the way, Tampa Bay beat Bratislava today 3-2 in an overtime shootout. A reason that it might've been so close is that there was a rumor going around before the game that the the owner of HC Slovan promised $14,000 (US) for each player if they beat the Lightning. And HC Slovan is the defending champion of their league, so let's give them a little credit for actually being a good team. I'm going to try to write a blog purely based upon statistics. Isn't that exciting? Let's see if I can make this work. If someone can tell me how close I got to this game, I'd really appreciate it. The Tampa Bay Lighting played Eisbären Berlin in Berlin, Germany, today. They won by a score of 4-1. However, the game was a lot closer than it appears. Eisbären scored the first goal in the first period, and the Lightning scored two goals apiece in the second and third periods. There were a few penalties in the game, although, they were mostly holding calls. Malone racked up some penalty minutes in the third, tho. He got a double-minor for roughing, and a 10-minute misconduct. And that made me think - Berlin isn't all German players, you know. There are 5 Canadians and 4 Americans listed on their roster. You know that those guys had to feel like they had something to prove. I mean, they're playing in Europe and not the NHL - but they were playing an NHL team. Makes me wonder how much smack was being said in English on the ice, and if Malone - after Tampa was safely ahead - decided to put someone in their place. At least two of those guys had played in the NHL before: Steve Walker and Denis Pederson. The two big stories going into this game were that Lecavalier played his first game since dislocating his shoulder in April at Washington, and that Kolzig made his return to his old team. Kolzig, who is German by nationality, played for Berlin during the most recent NHL lockout. Individual shots on goal were not available, so I can't tell you how Lecavalier did. He played a quiet game statistically in that he took no penalties and scored no points. Other than that, I have no idea how he played or how his shoulder held up. But since they were playing on international-sized ice, I suspect that there wasn't a lot of hitting going on anyways. I expect that the Tampa Bay area newspapers ought to have more on that tomorrow. Kolzig did well. Although, from what I can tell, what ended up deciding this game were the shots on goal. Berlin and Tampa Bay were even through two periods of play, and the Lightning were only up by a score of 2-1. In the third period, however, the Lightning outshot Eisbären 21-5, as well as scoring two more goals. Next up is HC Slovan Bratislava on Tuesday. Again, this game is totally blacked out here in the US. Going to the European team's website was far more helpful than the NHL's. It doesn't take a lot to figure out what certain words mean, and there's always the online dictionaries if you're really curious. It's not that I'm such a diehard fan as it is that I'm impatient. I don't want to wait for the scores to come out hours later or even the next day, so I went hunting them down on my own. Patience has never been a strength of mine. If you're interested, HC Slovan Bratislava's website is http://www.hcslovan.sk/. If you start clicking on links, you'll eventually find what you're looking for. Good luck. You know, I really don't want to be proven right about this coming season. But games like the one against the Rangers don't inspire much confidence. 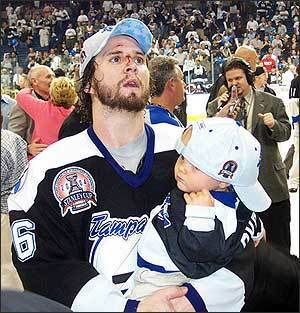 Somebody needs to tell Tampa Bay that they have to prove me, and everyone else wrong, okay? Really - I insist. The Lightning won over the Rangers last night in New York 4-2, and then promptly left for Europe after the game. That makes them 3-1 in their first four preseason games against Pittsburgh & the NY Rangers in home-at-home games. This is starting to feel a bit like baseball, if you ask me. Yes, they did win. But the reason they won was because of great goaltending and scoring. The defense was seriously lacking, as you could tell by the amount of shots the defense allowed on Ramo - a rather large total of 47. From what I could tell, the defense was pretty ineffective. The defense in hockey can be likened to the defensive line in football. If you don't have a good D-line, then you'll get stomped on. Every football fan has seen this. The D-line holds back offenses, and encourages turnovers so that their team's offense gets a shot at scoring. A breakaway is almost as good as sacking a quarterback. And a shot on goal in hockey is pretty much equal to a first down conversion, if you think about it. Ramo is a fantastic goaltender, and I've thought so since last season. Without him, the Lightning would've been blown out of the water. I think the toughest decision for the coaching staff will be choosing the goaltenders, frankly. They're all good. From what I can tell, Tampa Bay's final two preseason games in Europe are only going to be reported on the old fashioned way - by print. So no radio, and no tv - unless you understand either German or Slovakian, in which case you should be able to find at least radio broadcasts somewhere online. Unfortunately, I only know a little bit of French, so that doesn't help me any. However, results of some kind will be posted, regardless. Lecavalier is supposed to play on Sunday morning (10 am ET) against Berlin, so we'll have to wait until a couple of hours after the game for quotes to be posted online to see how that went. Ranger will probably not play at all this preseason, tho. Best of luck in Europe, guys. Preseason hockey is an interesting thing. Every night the lineups are different, so you're never quite sure what you're going to get. I would think that that would make decisions about who should stay and who should go more difficult. But then, I'm not a coach, either. I've never had any interest in coaching hockey - I'd much rather coach football. There's a huge difference in how to coach hockey players and football players, but I won't get into that here. There's a completely different mentality going on in football that would make it difficult for me to coach hockey. But I'll stop now since I don't want to offend any hockey players that might be reading this. The Lightning won last night against the NY Rangers 3-2. It was a pretty solid game, and a lot more disciplined - at least, on the Lightning side, anyways. The Ranger didn't fare so well during the second period, however. Shots for Tampa were way down from the night before, too. Stamkos got his first goal as a member of the Tampa Bay Lightning, St. Louis got his first goal, Jokinen was all over the place - but in a good way, and Smith was solid in net. Overall, it was a pretty good effort. Can't really complain about that. What I can complain about, tho, is the fact that they're playing the Rangers twice this preseason when they play them again twice in Europe in a week and a half. Who thought of this schedule, anyways? Would it have been so hard to play Ottawa instead? I mean, having two teams who hadn't played against each other since last season meet up in Prague to open this season would've added to the excitement. I don't have a marketing degree - heck, I don't even have a business degree - but even I can come up with better than that. So Tampa Bay plays the Rangers at MSG tomorrow night, and then it's on to Berlin, Bratislava, and finally Prague. That's a road trip that I really would've like to have gone on. Hopefully, the two preseason European games will be broadcast in some fashion. If anyone knows anything about that, please let me know. Thanks! The Lightning lost to Pittsburgh last night, 3-2. They were up early in the first, but that was the last they were ahead in the game. Tampa Bay put some serious shots on net, tho, with 39 for 3 periods. This game was sloppy, which is understandable since it was a preseason game, and the first game for many of these guys in front of a home crowd. But everyone was very enthusiastic. Again, not many big names played last night, but that’s how it usually goes in the preseason. Stamkos had a good game. So did Jokinen, Lundin, and Vrbata. There were still a lot of other names that I had trouble recognizing whose team they played for, tho. What got them in the end was poor discipline. Penalties were the reason why they lost this game. It’s not as if Pittsburgh was all that gentlemanly, either, but they had 10 total penalties to the Lightning’s 14. I mean, five fights for two guys on the Lightning? 47 penalty minutes combined for Konopka & Koci? This isn’t minor league hockey anymore, you know? I have no problem with fighting, although I can’t watch much of it because I’m too empathetic for that. But it’s got to have a purpose. If you’re standing up for yourself, or for a teammate, then go for it. I’ve been known to go after people who’ve taken things a step too far with a teammate, after all. And trying to get the coaches’ attention isn’t a bad thing during preseason, either. However, three fights is a little excessive for one game. That tells me that the guy doesn’t have the discipline he needs to be in the NHL – at least not right now. Two fights, well, things like that happen sometimes, but three is really just taking it over the line. Hey – did anyone else notice that the LA Kings played two games last night? The split their training camp squad into two teams and played both Phoenix & St. Louis, winning both of their games. That probably won’t be making the decision making process any easier. Kind of a crazy idea, but baseball does things like that sometimes. The Tampa Bay Lightning won their first preseason game in a shootout 5-4 last night. The much heraled Steven Stamkos put in the game winning shootout goal. Not a bad way to start the season. For those of you who didn't listen to this game on the radio - or over the internet like I did - you missed an interesting game. Sure, it's preseason and Lecavalier, St. Louis, Malone, Recchi, Roberts, or Kolzig did not make the trip, but did you take a look at the Pittsburgh roster? The Lightning fielded a bunch of guys I'd barely heard of, but Pittsburgh had basically their starting roster on the ice - including Crosby, Malkin, and Fleury. You know, that's not a bad deal for a bunch of guys who were only thrown together about 5 or 6 days ago. They beat almost the same bunch of guys who made it to the Stanley Cup Finals - and without the members of that team that ended up with Tampa Bay. That's something to think about, even if it is preseason. It started off a little shaky. Ramo had one go by in within the first 30 seconds of the game. And then, when they were up 3-1, they let Pittsburgh back in the game. But then buckled down and won it in the end, which is what matters. Forwards, take note of the score. That's shades to come of your plus-minus this season. Not pretty, is it? So it'll be interesting to see if these guys do better, or worse, with the big boys in or not. I realize that part of the reason that they did so well was because Pittsburgh wasn't familiar with most of those guys. Opposing teams pretty much know what to expect from Lecavalier, St. Louis, and Prospal when they're on the ice, after all. At least they should, by now. Still, it's a promising start, all the same. The awaited and expected news came thru today. Tampa Bay has named Vinny Lecavalier captain of the Lightning. Again. I wish him the best of luck. It could be a very difficult year, after all. And he’s probably going to need all the help that he can get by the end of it. As I’ve said before, I think Lecavalier will be a good captain for the Lightning. He seems to be very well-respected by his teammates, seems like an intelligent guy, and he’s a disgustingly talented hockey player. And seems like he really cares about the game, his team, and winning. So it should be good choice, I think. Finally the off-season is almost over. Camp has started and we are getting a look at the Koules/Barie/Melrose Bolts. The Bolts will start the preseason on the road Saturday at Pittsburgh, then return home for another game against the Penguins Monday night. In between the games, the Lightning will host Ice Fest at the Forum Sunday, 10am-4pm. As of right now, the Lightning website doesn't list a Captain. Only Vinny and Marty are listed as assistants. I'm guessing there may be some big news at Sunday's Ice Fest in regard to the opening. My money is on Lecavalier. Anything else just wouldn't make sense. Sorry – I’ve been distracted by the beginning of college football season. For those of you who follow college football, I have to tell you that I’m a Washington Huskies fan, and I’m still a little upset by that celebration call last weekend against BYU. I know that you all know exactly the one that I’m talking about because ESPN was all over that like a bad date. That’s the way the bad rules go, though. The penalty against Locker was technically called correctly. Hopefully the NHL officials will be so dedicated about making their calls, right? However, I’m now back for the season. We have all been rewarded for our patience, and training camp opens up this week. Hooray for hockey! Too bad I’m too far away to attend, though. Okay, I’m going to give this Tampa Bay Lightning season preview a try. Right around the beginning of the season I might do a Southeast Division season preview. But I think I’ll wait until then since I’d like to have a better idea of actual rosters. I’d really like to be able to sugar-coat the Lightning’s outlook, but that’s just not the kind of girl that I am. So here’s my unvarnished opinion – Tampa Bay is going to have a rough time of it, particularly at the beginning. That’s not so profound, I know, but you’ve got to start somewhere, right? It all ends and begins with the defense. But that’s no surprise to anyone. All you have to do is read various hockey pages to get that. Heck, all you need to do is to look at the roster for yourself. I’m really hoping that the defense will prove everyone wrong and be outstanding, but I’m not counting on it. Some people might want to point fingers at the goaltending, but I think that’s actually pretty solid this season. Smith played very well for the Lightning at the end of last season, Ramo was also pretty good, and Kolzig has always been a great goalie. So, I think that position is actually pretty well covered. The only bad thing with the forwards is that there are too many good ones to choose from. You can come up with 6 pretty good forward lines out of who’s listed on the team website right now. One guy will get a lucky break since Halpern’s out until probably January. But that still leaves a lot of guys to choose from. I won’t even discuss the possibility of Mats Sundin joining the team. I don’t think it’s likely, one. And two, that’s just plain craziness to add yet another forward when you need to shore up the defense. They have different priorities from the rest of us, I guess. Not to mention that this is supposed to be Lecavalier’s team, and they want to bring in another star player? Who was also a captain? Talk about a bad dynamic there. Someone’s obviously not thinking clearly with that. It wouldn’t matter if Lecavalier and Sundin were the best of friends – in the end, I just don’t think that would work out very well. I’m also really hoping that the new coaching staff will work out well. But I get the sneaky suspicion that that’s not going to necessarily happen. Nothing against Melrose or his assistants at all, though. I just think that the ownership, with their overly hands-on approach, is going to end up screwing over the coaching staff by undermining their authority with the players. Think about it. Melrose used to be a defensemen, and he likes a hard-hitting and tight defensive style of play. He’s said that often enough, anyways. It’s obvious that the ownership doesn’t like that style of hockey since they don’t have that kind of a team. The ownership apparently likes a very skilled and high scoring offensive style of play, and they’ve built their team accordingly without taking their coaching staff’s opinions into consideration – if the coaching staff was even consulted about it in the first place. I suspect that that difference of opinion is going to get ugly, and probably sooner rather than later. Melrose isn’t the kind of guy who’s going to keep that kind of stuff to himself unless he has to. And, if you’re a player, who would you listen to? Your coach or the guy who signs your paycheck? Probably not the coach. So don’t be surprised if Melrose doesn’t last the season. Not because he’s a bad coach, but because ownership picked the wrong guy for the kind of team they wanted. So I don’t think this is season is going to be one of the good ones. Realistically, with the kind of talent that they have, they should barely squeak into playoffs – even with the defense being as young and inexperienced as they are. But a lot of that will be dependent upon how well this team finally gels, how good a leader the guy who’s finally named captain is, and if the coaching staff will be allowed to do their thing without ownership interference. In all honesty, talent is the least of their worries right now. But, in the end, you stick with your team through the good and the bad because they’re your team. And, as a team player – and believe me, fans are an integral part of any team – you’ve got to support your team. I grew up with the mediocre sports scene of Seattle, where most teams either weren’t good enough to make playoffs or bad enough to get a good draft pick, but everyone supported them anyways. And regardless of how the Lightning does, their fans will stick by them – just like they did all last season, despite being dead last in the league. Because that’s just what teammates do. Fan since the beginning. Fan till the end. The Lightning in yet another state of limbo? Worst trade of the year? Knew I shouldn't have mentioned it!